Be firmly assured that the evil is kindled in your heart by the enemy; he chiefly assaults the heart through a full stomach. This is from experience. Sin is foolish and destructive. For instance, a drunkard, from the excessive use of spirituous liquors, becomes ill, and indulges in various dissipations and shameful acts, which he himself is ashamed to think of and remember afterwards. And yet he continues to give himself up to drink. A glutton, after excessive eating, feels a heaviness, his capabilities become obscured, his tongue is bound, and he himself sees that he has become like an animal or bestial in nature, because he often breathes malice and spite against those who live with him, or who daily ask alms of him. He is subjected to oppression and affliction; he is deprived of peace and tranquillity; he becomes incapable of meditating upon heavenly things, or of being a true Christian, of living for the highest purpose of existence. And yet he continues to be greedy after dainties and eating. ...Having lost their strength and health in dissipation and drunkenness, they become prematurely aged, decrepit, dull, fall ill and die. If you wish to live long on the earth, do not hurry to live in a carnal manner, to satiate yourself, to get drunk, to smoke, to commit fornication, to live in luxury, to indulge yourself. The carnal way of life constitutes death, and therefore, in the Holy Scripture, our flesh is called mortal, or, " the old man, which is corrupt according to the deceitful lusts." If you wish to live long, live through the spirit; for life consists in the spirit: "If ye through the spirit do mortify the deeds of the body, ye shall live," both here on earth and there in heaven. Observe temperance and simplicity in food and drink; preserve chastity; do not foolishly squander the balsam of your life; do not seek after riches, after luxury; strive to be contented with little; keep peace with all, and do not envy anyone — respect and love all; and, above all, strive ever to bear Christ in your heart, and you shall live in peace and felicity for many years. When your heart is struck by avarice, say to yourself: "My life is Christ, the Beloved of all. He is my inexhaustible wealth, my inexhaustible food, my inexhaustible drink. Our blind flesh dreams of finding life in food and in money, and bears ill-will against those who deprive it of these material means of life. But be firmly persuaded that your life is not money and food, but mutual love for the sake of love for God. Remember that God is Love, uniting all things animated by the laws of love, and bringing forth life from the union of love. Take care; do not forget, Christian; never lose hearty faith in Him Who is your invisible Life, your Peace, your Light, your Strength, your Breath; that is, in Jesus Christ. Do not believe your heart when it becomes gross, darkened, unbelieving, and cold from plenteousness of food and drink, from worldly distractions, or finally when you live by the intellect, and not by the heart; that is, when you exercise the intellect and neglect the heart, or, when you enlarge and adorn the net, leaving the fisherman himself in poverty and need; for the heart, comparatively speaking, is the hunter or fisherman whilst the intellect is the fisherman's net. Do not rejoice when your countenance is bright from pleasant food and drink, because then the inward face of your soul is hideous and deadly, and at that time the words of the Saviour Christ are applicable to you: "For ye are like unto whited sepulchres, which, indeed, appear beautiful outward, but are within full of dead men's bones" — that is, of hypocrisy and iniquity. You must pay most strict and active attention to this your daily action of eating and drinking, for from food and drink, from their quality and quantity, your spiritual, social, and family activity very greatly depends: " Take heed to yourselves, lest at any time your hearts be overcharged with surfeiting and drunkenness." Tea and coffee also pertain to drunkenness if indulged in unseasonably and to excess. O, woe unto us who are full now, and frequently look neglectfully upon God's gifts. The incorporeal enemy enters the heart of man through satiety and drunkenness — this can be felt by anyone who is observant. This is the reason why, with the growth of drunkenness, the inclination to drunkenness increases so terribly (because the power of the enemy over the man increases) — this is why you notice in drunkards a power involuntarily drawing them to satisfy their passion or their inward craving for wine. The enemy is in the hearts of these unhappy people. How can the demon of drunkenness be driven out? By prayer and fasting. The enemy enters the hearts of men because they have given themselves up to a carnal mode of life — to gluttony, and because they do not pray. It is, therefore, natural that he can be driven out from them by opposite means — that is, by prayer and fasting. The Word of God says, "Be not drunk with wine";  whilst you builders of public-houses say, "Get drunk with wine," and have built thousands of public-houses to tempt your brethren. And yet you go to church and pray in your homes. Those who go to attend the Divine service after having eaten much, voluntarily lay upon themselves an unnecessary and injurious burden, and deaden their hearts beforehand to prayer, obstructing the access of holy thoughts and feelings to it. We must be most careful not to eat before Divine service. We must remember that "The kingdom of God is not meat and drink," that is, that God cannot reign in the heart that is overburdened with surfeiting and drunkenness. If you see a drunken man, say in your heart: "Lord, look mercifully upon Thy servant, allured by the flattery of the belly and by carnal merriment; make him understand the sweetness of temperance and fasting, and of the fruit of the spirit arising therefrom." When you see a man passionately fond of eating, and finding all his happiness in this, say: "Lord, Thou art our sweetest Food, that never perishes, but leads us unto life eternal! Purify Thy servant from the filthiness of gluttony, so carnal and so far from Thy Spirit, and grant that he may know the sweetness of Thy Life-giving, spiritual food, which is Thy Flesh and Blood, and Thy holy, living, and acting word. "In this or in a similar manner pray for all who sin, and do not dare to despise anyone for his sin, nor be vindictive, as through this you would only aggravate the wounds of those who sin; but rather correct them by means of such advice, threats, and punishments as may tend to stop or restrain the evil within the limits of moderation. Do not believe, brethren, in the enemy's enticements, not for one single moment, when the matter concerns food and drink, however plausible they may apparently be. By feeding largely, one becomes a carnal man, having no spirit, or soulless flesh; while by fasting, one attracts the Holy Spirit and becomes spiritual. When cotton is not wetted with water it is light, and if in a small quantity flies up in the air; but if it is wetted, it becomes heavy and at once falls to the ground. It is the same with the soul. O, how important it is to preserve it by fasting! Unfortunate is he who is passionately fond of eating and drinking, cares for surfeiting and enjoyments: he will indeed find, when he begins to labour for the Lord, that food and drink, if we set our heart upon them, are a heavy burden for the body, affliction and destruction for the spirit, and that man can be really satisfied with very, very little and simple food. One cannot eat and drink and smoke continually. One cannot turn human life into constant eating, drinking, and smoking (although there are men who do eat, drink, and smoke almost uninterruptedly); and thus the spirit of evil has turned life into smoking, and made the mouth, which ought to be employed in thanking and praising the Lord, into a smoking furnace. The less and lighter the food and drink you take, the lighter and more refined your spirit will become. When during prayer the enemy suggests within you a craving for food, despise this material, nervous irritation, strengthen your heart more powerfully by prayer, inflame it by faith and love, and say to the tempter the following words of the Lord: "Man shall not live by bread alone, but by every word that proceedeth out of the mouth of God." Prayer is my best food, fortifying and enlightening both the soul and the body. Do not let the enemy shame you for laying your hopes upon such earthly dust as money and food, more than upon God, but shame him himself by your firm trust in God and in His Holy Word. For "man shall not live by bread alone, but by every word that proceedeth out of the mouth of God." Mark; "by every word." For every word of the Lord Creator can support your life, just as every word can create and transform thousands of creatures. "For He spake and it was done; He commanded and it stood fast." What infinite nothingness our food and drink represent on the one side, and what infinite grandeur the man himself who is fed by them represents on the other side! Is it not the greatest insanity for man, for his image of God, for this partaker of the divine nature, for whom God may be all — "God may be all in all" — to grudge food, drink, clothing, dwelling, and anything else earthly! Let the dust be dust — but let the immortal image of the immortal God be always exalted and preferred before everything earthly, corruptible and transitory! Therefore, do not let us be sparing of anything for our neighbour! O, what a great honour it is — to feed, to clothe, to give rest to the image of God! Most-gracious and Most-bountiful God! fill our hearts with mercy and bountifulness! The corrupted man continually wishes to eat and drink, to continually satisfy his sight, hearing, smell, and feeling; carnal men satisfy themselves with dainty food and drink, fine sights, music, smoking, magnificent edifices, and outward splendor. O, how fearful it is to use food and drink for amusement, to eat and drink in excess! A full stomach makes a man lose faith and the fear of God, and makes him unfeeling in prayer, thanksgiving, and praise to God. A satiated heart turns away from the Lord, and becomes as hard and unfeeling as a stone. This is why the Saviour carefully warns us against surfeiting and drunkenness: "And so that day come upon you unawares," because of the wrath of the Lord upon us for heedlessly and idly spending the time in eating and drinking. Food and drink must only be used for strengthening our powers, and not as dainties, and we must not eat when nature does not require it. Many of us (and I myself the first), if we do not repent and correct ourselves, will be condemned for having eaten and drunk unseasonably, and thus for having lived, having understanding, like the brutes that have no understanding, and for having darkened our foolish hearts. You have amused yourselves with food and drink, and have often eaten and drunk when there was no need for you to eat and drink: "Woe unto you that are full! for ye shall hunger." "Ye have lived in pleasure on the earth, and been wanton; ye have nourished your hearts as in a day of slaughter." The Devil takes captive and conquers man in this world by excessively exciting his natural spiritual and bodily needs, such as: the need of food and drink (and as everything has to be bought with money, therefore of money, too), the need of clothing, the need of pleasures, the need of honours or fame, and of a good name. All these and other similar requirements of man, which God has put into the very nature of man, are continually perverted by the Devil, who carries them to extremes, sometimes quite needlessly (for instance, with eating and drinking), and thus ruins both soul and body, and diverts the soul from God through its attachment to material things, and through its falling into sensuality and into the passions of malice, pride, envy, despondency, slothfulness, gluttony, fornication, drunkenness, covetousness, ambition, and so forth. And therefore fasting, chastity, disinterestedness, kindness, meekness, humility, faith, hope and love, prayer and meditation, are necessary. Health and the belly, these are the two idols — especially with men of the present age, of whom I myself, a great sinner, am one — for which we live, and which we continually serve, even to the neglect of the duties of our Christian calling — for instance, to the neglect of the reading of the Word of God, which is sweeter than honey and honey-comb; to the neglect of prayer, that sweetest converse with God, and of the preaching of the Word of God. To walk a great deal for health, and to incite the appetite, to eat with appetite — such are the objects of the desires and aspirations of many of us. But through our frequent walks, through our fondness for food and drink, we shall find that one thing has been neglected, and another irrevocably missed, whilst others have not even entered into our minds; for can the time after a good dinner or supper be really a good time for any serious work! Even if we would like to occupy ourselves with work, the belly, full of food and drink, draws us away from it, and constrains us to rest, so that we begin to slumber over our work. What sort of work can it be? 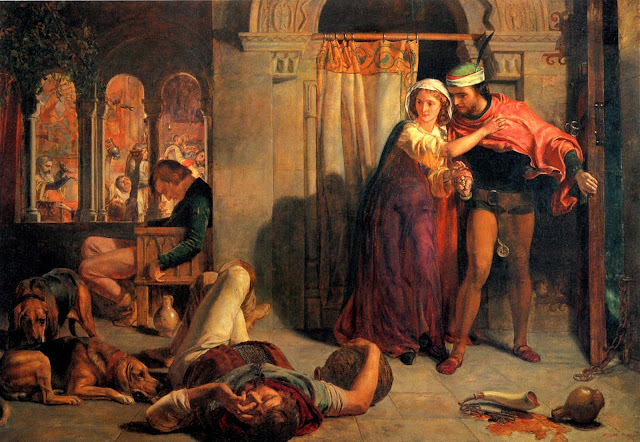 Indeed, there is nothing left, if it is after dinner, but to lie down and rest, and if it is after supper, after having prayed somehow or other (for a satiated man cannot even pray as he should), to go to bed and sleep — the miserable consequence of an overloaded stomach — until the next morning. And in the morning there is another sacrifice to your belly ready in the shape of a dainty breakfast. You get up, pray, of course not with your whole heart — since with our whole heart we can only eat and drink, walk, read novels, go to theatres, dance at evening parties, dress elegantly — and thus you pray, out of habit, carelessly, to save appearances, only as a form, without the essence of the prayer, without lively faith, without power, without any fervour in your petitions, praises, and thanks to the Lord God for His uncountable mercies, and then you hurry again to food and drink. At last, when you have eaten and drunk so much that now, scarcely able to move, you are ready to begin work, if it really is work, and not rather inactivity — such, for instance, as trading with some worldly vanities, accompanied by an abundance of swearing, lying, and cheating. In such or a similar way, with many and many of us, our present life passes away, and our days consume in vanity,  whilst we care little for that which is the most important matter on earth — the salvation of our soul. Thus our life is spent mainly in the worship of two brittle idols — health and the belly — and then dress; so much so that many, by worshipping fashion, sacrifice even their health and food, thus going to the other extreme... Christian! it is not for your health, belly, dress, and money that you must care; you must strive after love for God and your neighbour, for these are God's two greatest commandments. "He that dwelleth in love dwelleth in God and God in him." O, how low has our nature fallen through our passion for eating! O, thrice accursed Satan, who has precipitated us, and still precipitates us, through food, into thousands of evils! O, food and drink, that so powerfully tempt us! How long shall we be allured by you and place our life in you? When shall we engrave deeply upon our hearts the Saviour's words: "Man shall not live by bread alone, but by every word that proceedeth out of the mouth of God," and bring these words into our life and actions? How long will our greediness, self-indulgence, surfeiting, and drunkenness continue? How long will our abominable avarice and love of money continue? How long will our pride, animosity and malice against our neighbour, through money, dress, houses, food, and drink last? Thousands of Satan's deceits, by means of food, dress, and money, disclose themselves to our spiritual vision, and yet we still continue to be allured by his enticements as though by something real, useful to us, whilst in fact we are caring for neither more nor less than destructive illusions, and for that which is most pernicious both spiritually and bodily to our own selves. Do not believe, brethren, in the enemy's enticements, not for one single moment, when the matter concerns food and drink, however plausible they may apparently be. "Seek ye first the kingdom of God and His righteousness; and all these things shall be added unto you." "I spake not to you concerning bread, that ye should beware of the leaven of the Pharisees and Sadducees, which is hypocrisy," in matters of faith and piety. Pay the utmost attention to faith and piety. "Labour not for the meat which perisheth, but for that meat which endureth unto everlasting life, which the Son of man shall give unto you." Give away even the last that you have, if there is need of it, remembering the words of the Saviour: "If any man will sue thee at the law and take away thy coat, let him have thy cloak also" — that is, give away the last that you have. When hungry, do not throw yourself upon food — else you will overload your heart and body. Eat slowly, without avidity, with reflection to the glory of God, remembering the God Who feeds us, and above all His incorruptible food, His Body and Blood, that out of love He has given Himself to us in food and drink, remembering also the holy word of the Gospel. The heart is refined, spiritual, and heavenly by nature — guard it; do not overburden it, do not make it earthly, be temperate to the utmost in food and drink, and in general in bodily pleasures. The heart is — the temple of God. "If any man defile the temple of God, him shall God destroy." St. Matthew xvi. 11; St. Luke xii. 1. St. Matthew xxiii. 27, 28. 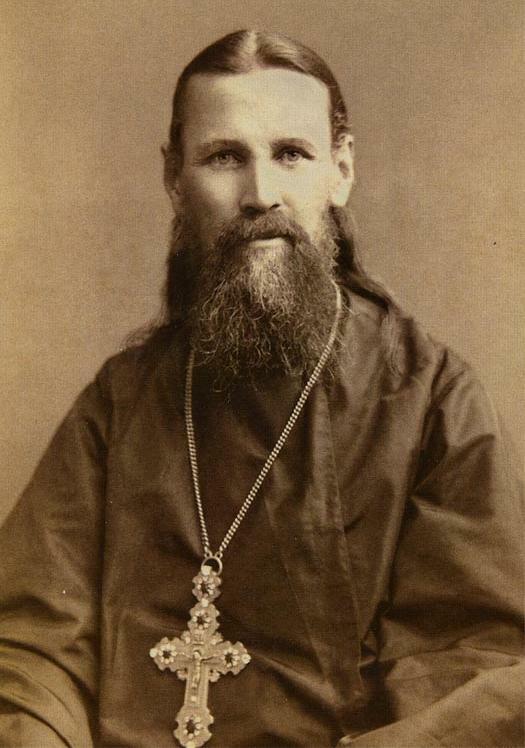 Source: Excerpts compiled from: My Life in Christ or Moments of Spiritual Serenity and Contemplation, of Reverent Feeling, of Earnest Self-Amendment, and of Peace in God, St. John of Kronstadt.